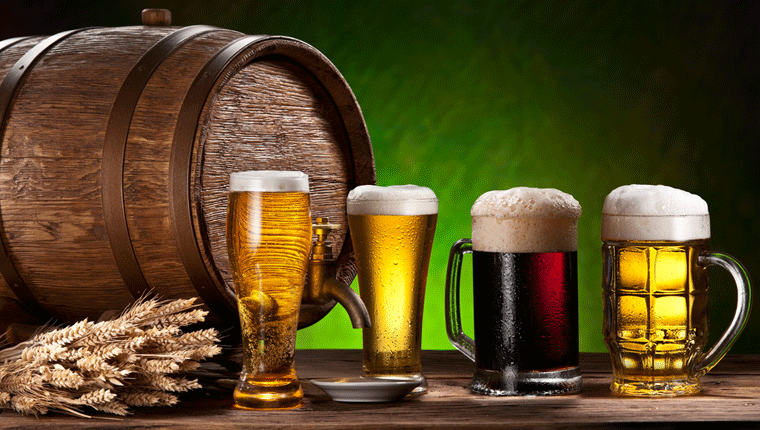 What’s in a beer glass – other than beer? Drinking beer from a glass offers much more than a demonstration of good manners. But which glass to choose? Using these different types of glasses also requires a different way of serving beer. Many bartenders will rinse or wet the glass when serving Belgian-style beers, to manage the head (so the beer’s not wasted by frothing over and down the side of the glass). Chilled beer glasses work deliciously well for lager styles, and for ales, the glass should be clean, dry and room temperature. Marketing is responsible for many a rational outcome going begging, and the design and introduction of many styles of beer glasses can be attributed to good old fashioned sales hype. But not all beer glasses are the result of a marketing gimmick, cheap production requirements or Government regulations. Many have been crafted over centuries, with the most popular having been specifically designed to harness the aromas, flavours and attributes of the beer they contain. With the growing popularity of local, international and boutique beers, many pubs and bars are changing how they serve up their tasty amber ales, reflecting the diversity of the beer types on offer. Here are some of the major beer glass varieties, and insights into why their styles differ. The British (or Irish or Imperial) pint actually comes in a number of shapes although the volume contained (568mls) remains the same. Walk into a typical, everyday, garden variety pub in the UK and you’ll likely be served a pint in an imperial pint glass (a ‘conical’) which is slightly tapered from a narrower base to a wider mouth at the top. A variation to this basic ‘conical’ design is the ‘nonic’ version which has a bulge a few centimetres from the rim. Some believe this is to give the glass strength and resist chipping, but for the consumer it results in a better grip on the glass. The other two pint glass styles are the ‘tulip’, a more modern shape than the ‘conical’ and often used to serve lighter lagers, and the ‘jug’ glass, or ‘dimple mug’. These latter are considered more traditional, having a sturdy handle and being made of thickened, dimpled glass – originally designed to resist breakage during hand washing and to give patrons a good grip on their beery beverage. If you’re served a ‘dimple mug’ (lucky you) it will likely be because you’ve ordered a stout or heavier ale. In general British pint glasses have a wider mouth than their European counterparts, designed to allow the top-fermented ales room to gently froth and breathe. Germany, and Bavaria in particular, has a long heritage in beer production. Along with Austria, Belgium and Switzerland, there are a number of Germanic European beer glasses uniquely associated with the type of beer they’re designed to serve, and which have existed in their traditional format for centuries. Let’s start with the ubiquitous ‘stein’. A chunky, clunky, gigantic glass, porcelain or pewter jug, the stein comes into its own in Oktoberfest when almost 7 million litres of beer are drunk each and every year in Munich alone. Some traditional steins come with a hinged lid, said to stop diseased flies falling into the beer during the Black Plague. On a more delicate note, Bavarian wheat beers are a pale, blonde, wheaty lager with a powerful kick. They’re often served in a ‘weizen’ beer glass, very tall and slender with a narrower bottom gently curving out to a wider mouth. The shape is designed to promote a thick frothy head, traditional with German lagers, and the handle stops heat transfer. Something we’re only starting to get to grips with in Australia is fruit beer. There are some seriously terrific Belgian beers scented with cherry, plum and berries available nowadays, and they’re traditionally served in a ‘flute’ glass. Nothing like the dainty champagne flute, the Belgian beer ‘flute’ nonetheless sits on a short stem and features a broad, tulip shaped bowl that is said to help maintain carbonation and allow aromas to develop. And although it sounds as though it should have been phased out around the time of King Arthur, the ‘goblet’ (keeping with the ancient theme) is still oft used across Europe. Looking vaguely like a very big, chunky wine glass, the goblet’s stem is useful in keeping the contents cooler for longer and is a good choice for stronger brews. Let’s start with the ‘pilsner’. A good pilsner glass – not too dissimilar from a weizen or a conical pint glass – is tall and tapered, again allowing for a good head formation. Its design is also somewhat aesthetic, meant to accentuate the clarity and colour of the beer. The ‘snifter’ is truly unique in the world of beer where glasses tend to the long-and-tall or big-and-wide. It’s a rounded glass with a narrow opening, a bit like a cognac or brandy glass, and is designed to trap the aromas within. And just to round off your options for beer glass selection, there’s‘the boot’. Supposedly started as a German army tradition in the Great War, a leather boot filled with beer would be passed around before action. ‘The boot’ is really not designed for any sensory satisfaction.